The 1kW system is one type of solar panel installation available for domestic use. But should you install one on your roof? We’ve compiled an advantages and disadvantages guide to help you decide. A big advantage to solar panels is that they supply you with free electricity. Sunlight doesn’t cost anything, so the power that it generates is also free. The 1kW system gives homeowners a great opportunity to produce free electricity. This is particularly beneficial considering the high rates that lots of energy providers charge. Another good reason to install solar panels is that they can lower your energy bills. This is due to the fact that the free solar power that you generate replaces some or all of the electricity that you would buy from an energy supplier. 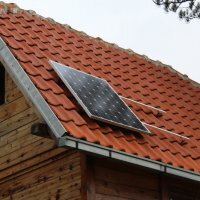 So installing and using a solar panel system will reduce the amount of electricity you need to buy and lower your bill. Solar panels are also beneficial because they can earn you money. The government pays solar panel owners a certain amount per unit of electricity that they generate through the Feed-in Tariff scheme. This is whether the electricity is used or fed back to the grid. The amount that you could receive depends on when you register your panels. This rate is usually guaranteed for approximately 20 years. For more information on the current Feed-in Tariff, see Ofgem’s website. A great reason to install a 1kW system is that it’s the cheapest domestic solar installation around. So if you don’t have much cash available but want to start generating solar power, it could be a good choice for you. Another benefit to fitting solar panels is that they can contribute to lowering your carbon emissions. The production of electricity from the main energy providers tends to contribute to carbon levels in the atmosphere, whereas the production of solar power doesn’t. So by using solar power instead of electricity from a main energy provider, you can lower your carbon emissions. Any solar panel system can earn you money, but the 1kW system is the type that will make you the least. So if making money is your main goal then you should probably consider buying a bigger system. The 1kW system is the type of installation that will make you the smallest total profit. Larger systems are more expensive but will make your more in the long run. So if you have the money available to install a bigger system, it might be a good idea to do so. So the 1kW system has many advantages and disadvantages. Installing one is a convenient way to start generating solar power and earning money, particularly if you don’t have much space. But if you want to earn as much as you can then you might want to install a bigger system.